A newly published book of historically based fiction explores the circumstances surrounding the execution of the only member of British forces executed for murder during the War of Independence. Author D.J. Kelly was interviewed by ExecutedToday.com, and presents an interesting perspective on the tyranny of British forces operating within Ireland in those years. My question to you all then is this: What family stories might you have related to encounters with the Black and Tans or Auxies? Here's a story from our archives, BTW, from fellow member Kieron Punch, about the British government's complicity in fomenting violence against Irish citizenry during the War of Independence. Where is the best place for me to find a copy? Is it available on Kindle? Yes Kelly (and that's a great name you have there, by the way!). 'Running with Crows' is available as a paperback and a kindle, via Amazon (UK, US etc), also via The Nile Books Australia, and to order via all good book shops. Same goes for my first novel: 'A Wistful Eye - The Tragedy of a Titanic Shipwright', which tells the true story of the 1910 murder of my great grandmother, whose husband, my GGF, was one of the men who built Titanic. Best wishes. DJK (Denise). Wow! Now I don't which to read first, haha. Thanks. the Kenyans fought hard for donkeys years to get the little they got It may not be completely settled yet either! "What family stories might you have related to encounters with the Black and Tans or Auxies?" My maternal G-Grandfather's brother, Michael Gleeson, owned the Record Printing Works in Cornmarket Row, Limerick, and was responsible for the publication of various Republican journals during the years of the Irish revolution. Newspapers he published included The Bottom Dog, which was Limerick's first paper for the working class, The Factionist, which was a Sinn Fein paper, and The People (a copy of which can be seen here: http://museum.limerick.ie/index.php/Detail/Object/Show/object_id/54691). He also occasionally worked with Arthur Griffith on the production of Nationality. 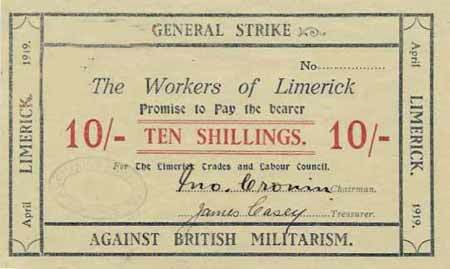 During the establishment of the Limerick Soviet in 1919, it was Michael Gleeson who was responsible for publishing the strike posters that went up all across the city, and he also designed and printed the Republican bank notes that were issued to the populace (an example can be seen here: http://www.indymedia.ie/attachments/apr2009/limerick_soviet_money.jpg). It was inevitable that the Record Printing Works would become a target for the British authorities and the premises was raided many times by the RIC/Black and Tans who attempted to wreck the printing machinery. One such raid was even reported by the New York Times http://select.nytimes.com/gst/abstract.html?res=F00C1FF9385F157A93C... Although the Tans did much damage to the building itself they never managed to destroy the metal type and printers' blocks and so the seditious newspapers continued to remain in publication, and even taunted the British over their failure to suppress them. The reason why the Tans never managed to destroy the type and blocks etc was because they were not stored in the printing works, nor in Michael Gleeson's home, which was also raided by the Tans, but were instead kept at the house of Michael's brother, John Gleeson (my G-Grandfather) who was a compositor/typesetter on the Limerick Leader newspaper, and who, with the aid of his sons (including my Grandfather who was also an IRA Quartermaster) composed the pages which were then secretly transported to the works so that the printing could take place. On one occasion my paternal Grandparents were quite badly roughed-up and prodded with bayonets by the Tans during a round-up of civilians in the vicinity of an IRA ambush on the streets of Limerick. When the Tans saw some other suspects they wished to arrest and question and thus became distracted, my Grandparents were able to slip away to safety. Thanks for that most fascinating bit of family history and those insights into republican history, Kieron. Kieron, I'm betting your courageous forebears would be proud to know that you are carrying forward their desire to tell the truth of it via the written word. I'm enjoying your accounts. Thanks for your kind comments. I am looking forward to reading your new book. Thanks Ger. My family has had connections with the newspaper industry/profession through several generations, going as far back as the 1820s. The last connection ended only a few years ago when one of my cousins retired as manager of the Limerick Leader. When I was a kid my granduncle used to tell us a story about a Black and Tan. My granduncle was too young to have participated in the War of Independence, he was just a young kid, be he witnessed a lot. He claimed that one night his older brothers took away a Tan who had been kidnapped by the IRA for "attacking a woman". They came back later, no Tan, so while he never said the words "they executed him", when I asked him where he was his reply was "He's there still." I don't know if it's 100% true or not that my granduncle was lying, he had no cause to do that but for example maybe he was an Auxilliary, a British soldier or a Z Special from an area away from their village that my granduncle wouldn't have known (but who to him, as a child, was a "Tan"). I have not made an exhaustive study of them, but there seems to be a lot of strange, undocumented claims made about the Tans, especially by people today, who think they were heroes. That's a sinister story, John, and most likely true. In those times, folks took the law into their own hands. You're right that a lot of dubious claims are made about the 'Tans'. The Anglo-Irish historian Brian Inglis claimed they were 'the sweepings of the English gaols' and so did my Grandmother. They were both wrong. This has become a popular myth but there is no evidence to suggest the 'Tans' included a greater criminal element than any other police force before or since. All the men recruited as temporary constables for the RIC were ex-servicemen; ex-combatants from The Great War; men who were blooded and battle-hardened. By 1919, the British government had several major problems. Firstly, there were thousands of demobilised soldiers unable to find work on their arrival back in the 'land fit for heroes'. Secondly, the troubles (the Irish War of Independence) had broken out in Ireland, resulting in the death of around 400 RIC constables and the resignation of a further 500 (out of fear or conscience). It made sense to recruit temporary constables from amongst the demobilised servicemen, since they had recent fighting skills. The British government had no need to use criminals to do the job, and that would not have solved the problem of what to do with desperate, unemployed ex-soldiers. If they'd been left to roam the streets, they'd have become criminals fairly quickly anyway. Amongst those thousands of ex-servicemen were significant numbers of Irishmen. Many had elected to be demobbed in the UK, rather than Ireland, as they held (vain) hopes of finding work there. The 'Black & Tan' recruitment records at TNA (Kew) reveal (according to several historians, including Bennett and Leeson) that 25% of the 'Tans' were Irish-born, and a further 5% or so were of Irish descent. All the temporary constables found themselves confined to barracks 24/7 and were bored, so they took to drink and got into mischief and much petty crime, pretty much as happens in any garrison town. 1,900 demobilised officers were also recruited to join the RIC, ostensibly to act as an officer cadre to the temporary constables (and were deemed the Auxiliaries). But whilst the temporary constables were posted to all RIC barracks to bolster the ranks of the regular constables in upholding the law, by contrast, the Auxiliaries formed themselves into 'hit squads' and became a law unto themselves. Contemporaneous eye witness accounts suggest it was the Auxiliaries who carried out the worst of the atrocities. They sacked and burned towns and cities such as Balbriggan and Cork, and even murdered the mayor of Cork. 24 Republicans would be executed during the Irish War of Independence but, by June 1921, no 'Tan' (constable or Auxiliary) had been executed for murder, even though several of them had been tried and acquitted (usually when the prosecution witnesses disappeared). The world's press were condemning the actions of the British Administration in Ireland; the Americans and heads of nations around the empire were protesting at Britain's lack of even handedness and even King George V voiced his discontent at the behaviour of the 'Tans'. Then, in the quiet market town of Dunlavin, Co Wicklow, a magistrate is murdered during the course of a bungled robbery at his home. A Scots-born 'Tan' commits suicide in the local barracks and one of his 'Tan' colleagues, an Irishman, is arrested as his accomplice, providing the British Administration with the perfect 'fall guy'. Dubliner William Mitchell was court martialed, without benefit of jury or right of appeal, in April 1921 and went to the gallows 92 years ago this month, on 7 June 1921, still protesting his innocence. Did he do it? Should he have hanged? In my novel ['Running with Crows'], which is closely based on the life and death of Mitchell, I present all the evidence and invite the readers to judge for themselves. Thanks for the post. Actually, his brothers were members of the Sinn Fein Police and the Tan would have been tried and sentenced to death by the Sinn Fein Courts. As these were the legitimate courts at the time (the people having boycotted the British courts), they were not "taking the law into their own hands" but obeying the order of the court. The story was in no way meant to be "sinister" I'm very surprised to hear you call it that. It was meant to demonstrate that at that time, in Ireland, if a government law enforcement officer raped a woman he received the death penalty which, in my opinion, was a good thing, not bad. As for the dubious claims made about the Tans I meant those being made by their modern day supporters (like Kevin Myers) who claim that they were heroes fighting terrorists. What a joke. The RIC (and then ADRIC members) was a political, paramilitary police force living in barracks and armed with carbines and grenades, a fascist gendarmerie which was a precursor to the Gestapo. With so many WWI veterans in their ranks one has to wonder how many of them had serious mental problems. If they were not criminals at home, they certainly became criminals in Ireland and you have to wonder if it was really a post-war economy that attracted them to the work or was it that they were too mentally disturbed to be hired for jobs at home. They sometimes shot people working the fields for "fun"; another time (in Kerry) they tied a man to the back fender of a car and drove the car until he was ripped to shreds and killed. These are clearly the actions psychopaths who are the dregs of society and not those with orders to restore the peace. On another note besides the many murders they committed there are documented accounts of British Army officers refusing to work with them, saving civilian and IRA prisoners from execution by them and of course, Black and Tans found guilty of murder by their own government who were then pardoned and released only to rejoin their ADRIC units.